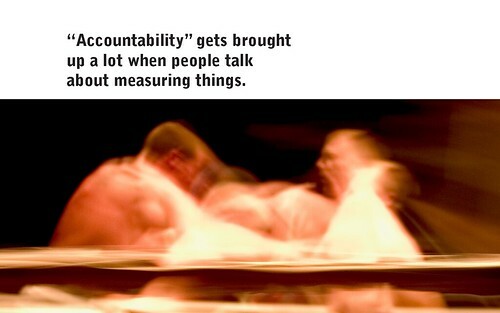 Usually when measurement is talked about, there’s a lot of talk about “Accountability.” I use the scare quotes because this talk is often scary. But it doesn’t have to be. The scary part of accountability is when the measurement systems aren’t balanced. For example, if your measurement is entirely focused on the past (usually masquerading as conversations about ROI). Just like it would be scary to be in a car going down the highway while everyone inside the car is facing the back of the car, it’s scary when your only measurement focus is on the rear view mirror. If your organization can make use of all three kinds of measuring: for understanding how things work, for informing specific future actions and for understanding the past … then you can develop a real culture of accountability–a culture where people are accountable for the decisions they make (based on data) as opposed to results which are likely beyond their control.